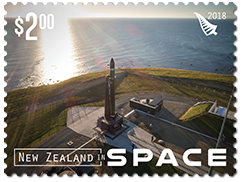 On Sunday 21 January 2018 New Zealand’s role in the international aerospace industry was elevated to a whole new level when Rocket Lab launched its Electron rocket into orbit from Mahia Peninsula. 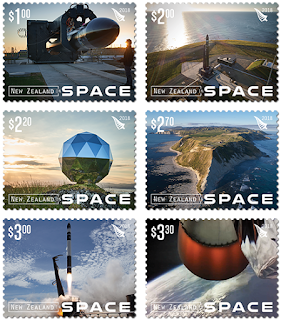 NZ Post celebrated this extraordinary achievement with a commemorative stamp sheet containing the six stamps seen below. Further down will be the sheet itself, followed by the enlarged stamps and detailed captions. 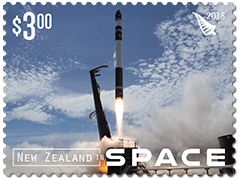 Virtual New Zealand Stamps wishes to congratulate NZ Post for developing and releasing this issue so quickly after the rocket's flight. 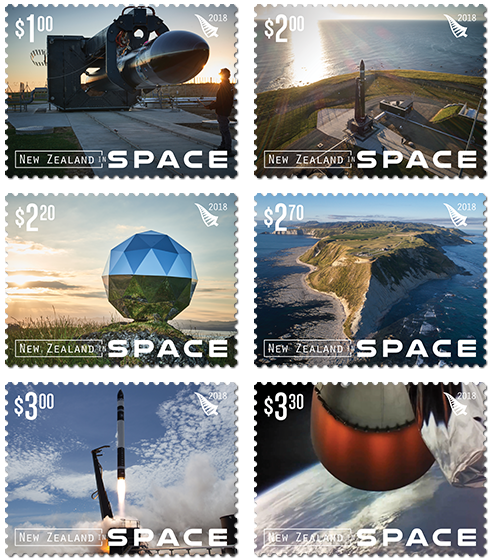 They are six great stamps on a subject not usually seen on New Zealand stamps. 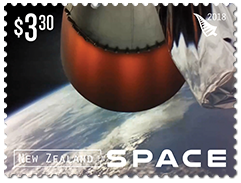 New Zealand has had a historically quiet role in the international aerospace industry – providing people, research and support and leaving the high-profile achievements in space discovery and exploration to leaders such as the United States, Russia, Europe and, more recently, China, India and Japan. However, on Sunday 21 January 2018, the country’s profile soared to a whole new level, as Rocket Lab used its New Zealand base to launch the Electron rocket into orbit for the first time. This landmark achievement was a critical step in the company’s mission to make space accessible for commercial enterprises. Rocket Lab was founded in 2006 by New Zealander Peter Beck, with the aim of developing lightweight, cost-effective and high-frequency rocket launch services. It soon became clear funding and support was needed from the USA space industry and so Rocket Lab became a USA company with a New Zealand based subsidiary. See also 2019 New Zealand Space Pioneers. 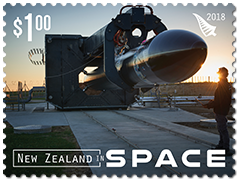 Photos for the stamps - Rocket Lab. Background image - Sam Taylor, Napier. $1.00 - The Electron Rocket. The Electron rocket horizontal in its cradle, ready to fly. Soon it will be placed in an upright position so final preparations and fuelling can be completed. Electron is a 17-metre-high, carbon-composite launch vehicle that can carry payloads of up to 225 kilograms (such as small satellites) into low orbit. These commercial flights could, in turn, enable satellite-based services, for example, affordable Internet, and boost Earth-based activities such as environmental monitoring and search and rescue. $2.00 - Electron on the Pad. As dawn breaks over the launch site, Electron stands ready to go. While this was still considered as the second of three test flights in many ways it could also be called an operational mission as three satellites were carried into space. The launch was delayed due to two unauthorised boats being in the area but once the all-clear was given, Electron was on its way. $2.20 - The Humanity Star. Although the successful launch was technically a test, Electron carried three customer payloads - 2x weather satellites and 1x Earth-observation satellite. In addition to these satellites the ‘Humanity Star’ was also deployed. With a focus on environmental sustainability, all three satellites and the Humanity Star are programmed to fall back towards Earth after use and disintegrate on reaching Earth’s atmosphere. The Humanity Star, a glittering sphere of triangular panels, will rotate Earth and be visible to the naked eye. In nine months or so, the Humanity Star will reenter Earth's atmosphere to be consumed leaving no trace of its passage through orbit. Peter Beck said, "My hope is that everyone looking up at the Humanity Star will look past it to the expanse of the universe, feel a connection to our place in it and think a little differently about their lives, actions and what is important." Some did not receive this idea well, accusing Rocket Lab of vandalism or night sky pollution. It is said that this "Star" is about the same brightness as the International Space Station. So, how many people have seen the Space Station without being told exactly where to look? $2.70 - Spectacular Launch Site. 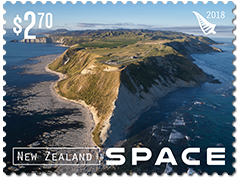 Rocket Lab’s New Zealand launch site is at the tip of Mahia Peninsula, an isolated location between Napier and Gisborne on the North Island’s east coast. 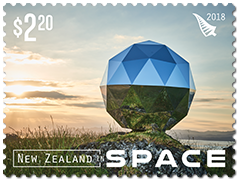 The first orbital launch site in New Zealand, and the first privately operated orbital launch site in the world, it’s an ideal location for launching satellites to provide services around the world. 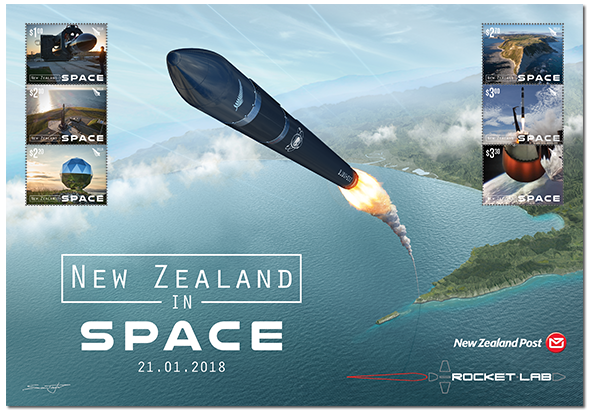 Local Maori have complained about access to the beaches below the launch site during launch windows but it is expected that once launches become regular events, the launch windows will be much shorter. The Electron is a two-stage rocket powered by Rutherford rocket engines that were developed by Rocket Lab and named after New Zealand born British scientist, Lord Rutherford. The engines use battery-powered electric motors for their fuel feed, a world first for orbital rockets. Almost all the major engine parts are fabricated by 3D printing, also a world first. The first stage uses nine of these engines, each developing 18 kN (4,000 lbf) of thrust. The second stage uses a re-startable vacuum optimised version of the Rutherford which develops 22 kN (4,900 lbf) of thrust. In space, the Electron can be moved to a higher or different orbit to meet the requirements of various customer's satellites that it is carrying. The vehicle is capable of delivering payloads of 150 kg to a 500 km Sun-synchronous orbit. The projected cost per launch is expected to be less than US$5 million. Date of issue: 25 January 2018. Denominations: $1.00, $2.00, $2.20, $2.70, $3.00, $3.30. Stamps designed: Saint Andrew Matautia, New Zealand Post, Wellington, New Zealand. Sheet background image designed: Sam Taylor, Napier, New Zealand. Period of sale: Unless stocks are exhausted earlier, these stamps will remain on sale until 24 January 2019. Information and images for this post came from. Some extra information came from the Rocket Lab website. I agree with you Mary & Allan. That must be one of the most spectacular lunching sites in the world. I like the background drawing on the miniature sheet too. I really like this post. As has been said above, that miniature sheet has a great background picture. I'm surprised it hasn't made your best posts collection. We voted for it to join our special posts list but it missed with two writers voting 'no'.